It's beginning to look a lot like Christmas around here!!! How 'bout at your house???? We've got the decorations up, the tree was finally purchased (from Home Depot- nope, not a fancy tree farm), cookies are baking, sweet treats are being consumed, lots and lots of trips to stores are happening, and YES lots of orders from Amazon!! I LOVE ordering from Amazon!!! - twine or some kind of string. Simply start by slicing the oranges about 1/4 of an inch thick. Then lay them flat on a baking sheet that has been lined with either parchment paper or a baking mat. The oranges will release some of their juice as they bake and the parchment paper or baking mat makes clean up easier and keeps the orange slices from sticking to the baking sheet. Place in a 200 degree oven and bake for 4 hours. Yes it takes a while, BUT if you try to bake them at a higher temperature, you will burn them. Remember, you are just drying them out so it's a slow process. 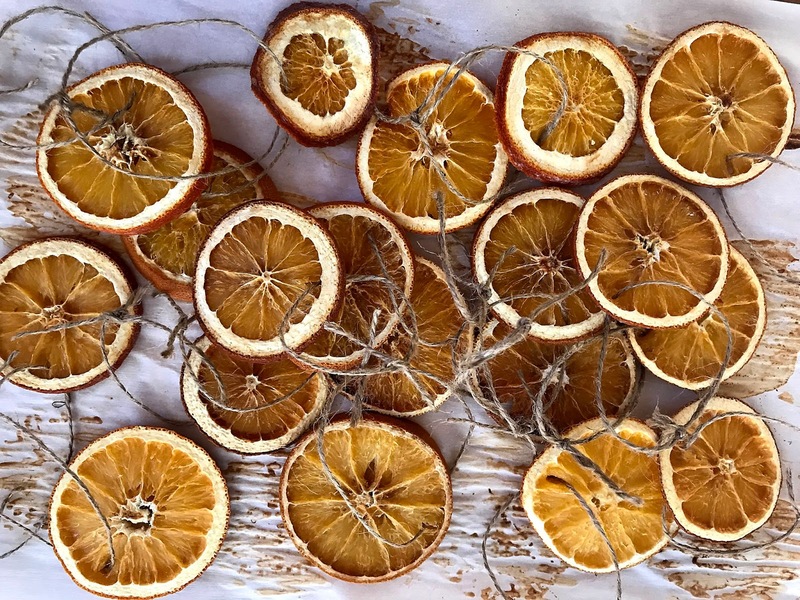 Turn each orange slice over every hour to make sure they dry out evenly. After the four hours, let them cool completely on the baking sheet 4 hours or overnight. This dries them out even more. Then, using the point of scissors, make a small slit in the dried orange and string with twine. Tie together and hang on your Christmas tree. This would be super cute tied on top of a present along with fresh rosemary, too!!! So that's it. Simple. Inexpensive. Homey. I'm all about making our house a home even at Christmas and this is just one way that you can do that, too. You also have such a beautiful blog and I'd love to follow you but I cannot find the Google+ gadget, so I'm doing copy and paste of the URL of your web page to receive your updates ! This orange garland is so pretty, I hope it smells nice as well. Happy Holidays. I love homey ornaments like this! Thanks so much for sharing with Party in Your PJs! 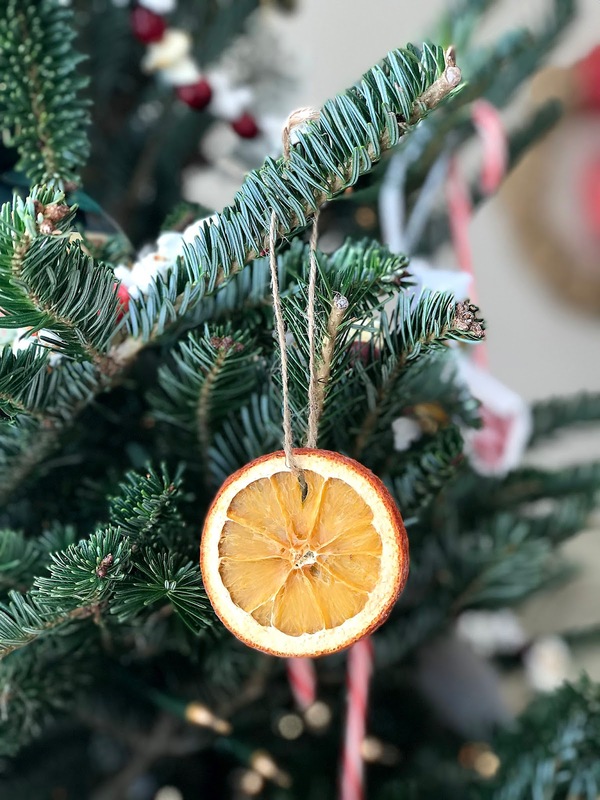 I absolutely love dried orange ornaments! Thanks for sharing on Homestead Blog Hop! Hi Christian, I can't believe the holidays are nearly over. We'll take the tree down at the weekend and the house will look big and bare (not a bad thing as our house is small). Theses simple dried orange decorations could be used to make a pretty potpourri too, it would seem a waste to just use them at Christmas. GREAT idea to use them in potpourri!!!!! Thank you! !